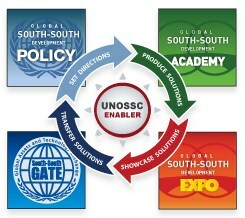 ﻿ United Nations Office for South-South Cooperation - What is SSC? South-South cooperation is a broad framework for collaboration among countries of the South in the political, economic, social, cultural, environmental and technical domains. Involving two or more developing countries, it can take place on a bilateral, regional, subregional or interregional basis. Developing countries share knowledge, skills, expertise and resources to meet their development goals through concerted efforts. Recent developments in South-South cooperation have taken the form of increased volume of South-South trade, South-South flows of foreign direct investment, movements towards regional integration, technology transfers, sharing of solutions and experts, and other forms of exchanges. Collaboration in which traditional donor countries and multilateral organizations facilitate South-South initiatives through the provision of funding, training, and management and technological systems as well as other forms of support is referred to as triangular cooperation. South-South cooperation is initiated, organized and managed by developing countries themselves; often, Governments play a lead role, with active participation from public- and private-sector institutions, non-governmental organizations and individuals. It involves different and evolving forms, including the sharing of knowledge and experience, training, technology transfer, financial and monetary cooperation and in-kind contributions. South-South cooperation can include different sectors and be bilateral, multilateral, subregional, regional or interregional in nature. South-South cooperation is a manifestation of solidarity among peoples and countries of the South that contributes to their national well-being, their national and collective self-reliance and the attainment of internationally agreed development goals, including the Millennium Development Goals. The South-South cooperation agenda and South-South cooperation initiatives must be determined by the countries of the South, guided by the principles of respect for national sovereignty, national ownership and independence, equality, non-conditionality, non-interference in domestic affairs and mutual benefit. enable developing countries to achieve a greater degree of participation in international economic activities and to expand international cooperation for development. accelerated professional training at different levels.